The undersigned is directed to refer to D.O letter No. 42/11/2018-P&PW(G) dated 1st July, 2018 from Secretary, Ministry of Personnel, Public Grievances & Pensions to the Secretaries of all Ministries/Departments with a appeal to hold Pension Adalats on September 18, 2018 with a objective of prompt and quick redressal of pensioners’ grievances. A copy of DO letter which is self explanatory is enclosed. 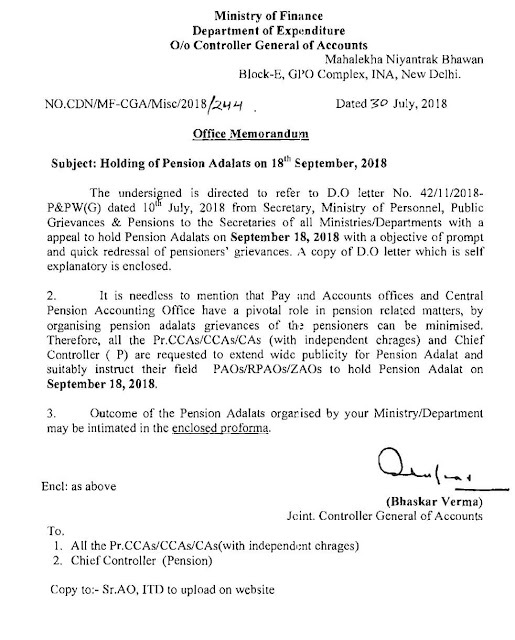 Therefore, all the Pr.CCAs/CCAs/CAs (with independent chrages) and Chief Controller (P) are requested to extend wide publicity for Pension Adalat and suitably instruct their field PAOS/RPAOs/ZAOS to hold Pension Adalat on September 18, 2018. Pension Adalats on September 18, 2018 with a objective of prompt and quick redressal of pensioners’ grievances. A copy of DO letter which is self explanatory is enclosed.